Bakewell's stone built bridge over the River Wye, which is Grade 1 listed, dates from about 1300. It is the oldest bridge in England. There are five Gothic arches on its lower side with the upstream side, which was rebuilt in the same style during the 19th century, having been repaired several times. Each triangular quoin over the buttresses has, at road level, two steps up from the road itself. Pedestrians would use these cut-waters to protect themselves from the traffic. The increase in traffic towards the end of the nineteenth century caused problems for the County's bridges. In 1883 Derbyshire County Council's Bridges and Highways Committee repealed bye-laws relating to locomotives that had been confirmed only the previous year. It was decided that locomotives should not be used on twenty-two bridges in the county as it was felt they would endanger the public. Several bridges in this part of Derbyshire were listed included those at Bakewell, Baslow, Calver New Bridge, Edensor, Rowsley, Matlock, Cromford and Two Dales. Ten years later William Henry Beeston, a traction engine proprietor, was summonsed and fined at the Bakewell Petty Sessions for taking a locomotive across Stokes Bridge. Such heavy vehicles could have caused serious damage to bridges that has previously only been crossed by a horse and cart. In 1891 Derbyshire County Council ordered a slight alteration to the bridge, raising the parapet 3ft. 6in. 1. "16.35 The Bridge Bakewell Peak District", Copyright real photo Donlion Productions Doncaster. Unused. Postcard in the collection of, provided by and © Judy Cooper. 2. 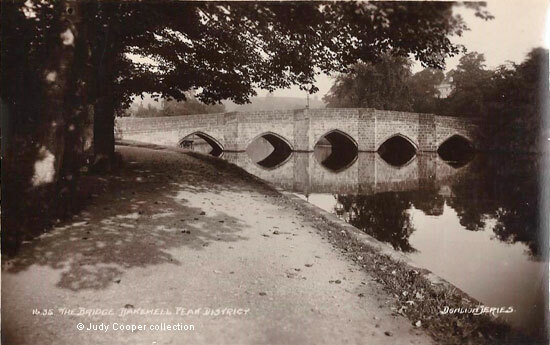 "Bakewell Bridge". Pen and ink drawing from "The High Peak to Sherwood, The hills and dales of old Mercia", Thomas Linthwaite Tudor (1926), published London by Robert Scott. With drawings by Fred Adcock and others. This drawing was done by Tudor. © Ann Andrews collection. "Derby Mercury", 18 July 1883. Highways and Locomotives Amendment Act of 1878. "Derbyshire Times", 15 April 1893. "Derby Daily Telegraph", 15 April 1891.